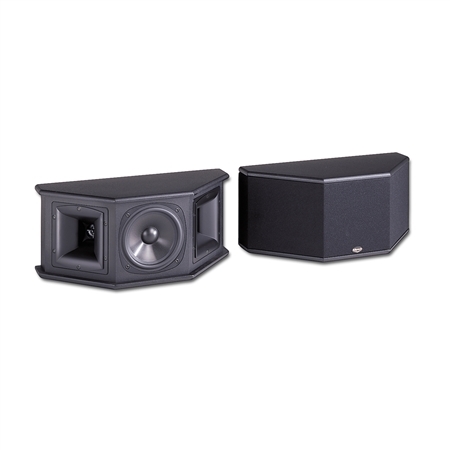 The Klipsch Synergy Series SS-1 surround speaker has raised the bar and changed the way people experience their favorite music and movies. As the first model to utilize Klipsch's exclusive Wide Dispersion Surround Technology™ (WDST) the SS-1 brings an astonishing dimension of reality and convenience to surround sound. The SS-1 uses two 1-inch magnetically shielded aluminum dome compression drivers with 90º x 60º Tractrix® Horns and a 5.25-inch magnetically shielded woofer. This winning combination delivers high output with low distortion broad dynamics and controlled coverage. The SS-1 boasts a sensitivity of 94 dB which puts it at the head of the class in output capability. Other benefits include a 5-inch square Tractrix® Horn for sonic harmonization with every Synergy system multi-way gold-plated binding posts and simplified keyhole wall attachment slots. Finished in a jet ash or white vinyl veneer the SS-1 fits in nicely with your décor and delivers superb envelopment and excellent localization of specific effects. While no longer in production the SS-1 is still owned and listened to by Klipsch fans around the world. To connect with other people who are passionate about audio and interested in Klipsch products visit our open forum bulletin board.